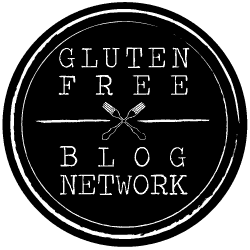 Several times, now, I’ve written about Planning for Meals, Freezer Planning, and so on. Quick recap for those who are new, here… the Inhabited Kitchen method of planning for meals involves making sure that I have food on hand – often partially or fully cooked – that can quickly and easily be pulled together into a real meal, with little time or effort. This way we still eat well if I get home late from a gig, or if I have a migraine, or if I’m just too busy writing this to fuss around in the kitchen. 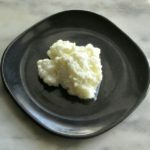 It’s largely based on two facts – first, it doesn’t take much more time and effort to prepare some foods in quantity, and secondly, some foods actually take less space in the freezer after they are cooked, but before other ingredients are added. I simply don’t have the space for a dozen ready to eat meals in our freezer. I also don’t have space for a dozen ready to cook meals. This is a suggestion for slow cookers that has become popular – assemble everything you need in a zip bag and freeze that, then just thaw, drop the food into the slow cooker in the morning, and go. And people post pictures of two weeks worth of the preassembled bags, all ready to go, and it does look tempting – but where would I put all that? But… when I made the chili, I did stop and brown the onion (though there is a work around for that, too) but I did not have to cut up the beef and brown it. I skipped lightly over that (because the explanation would have just made the post too long…) but since I have since replenished my supply – here you are. 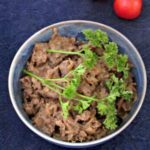 Years ago, I realized that it was useful to buy a Family Pack of ground beef, and then brown all of it, sometimes even with onion or other seasoning, and freeze the prepared meat. Even with the onion, it takes less room than the raw meat, since I’ve cooked out and drained liquid and fat, and it is so helpful to be able to just toss a bit into a pan, skipping the whole first step of browning. 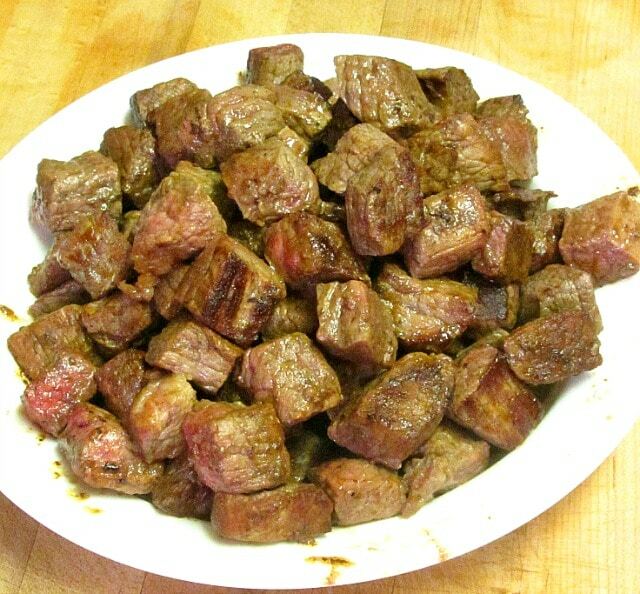 About a year ago, I took this the next obvious step, and started to brown cubes of meat for stew. 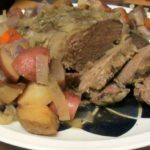 When I bought Stew Meat as such, I always had to cut it anyway – I didn’t like the huge chunks I’d get – so instead I look out for good buys on chuck or round roasts. 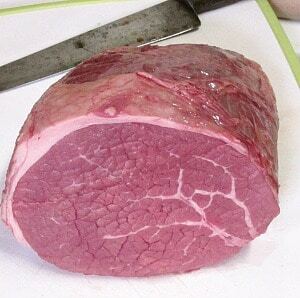 I buy a large roast, use part of it right away (usually in a pot roast) and cut the rest for later use. But then, I still had to brown it before using it, if I wanted a really good flavor – and freezing pulled out the juices and sometimes it was hard to brown recently thawed meat well, and half the time I wanted to put it right into a slow cooker, and not dirty another pan, and – the proverbial light went on. The other day our local store had a good price on a cryovac sealed eye of round. Half is, indeed, in the slow cooker as I write, for dinner tonight (and plenty of leftover pot roast, to be frozen itself for later use!) But right off I sliced off a large chunk, and started cutting it up. As I said, I prefer truly bite sized pieces, rather than fussing with a knife and fork in a bowl of stew. They also give me the freedom to use them in soup. Besides, that gives me more surface to brown, to get the wonderful flavor. Cook it in several batches, so you don’t crowd the pan, which interferes with browning. Once the meat is cut, raise the heat under the pan to medium, and add a little olive oil – just enough to keep the first batch of meat from sticking. When the oil starts to shimmer a bit, it is hot enough to sear the meat. 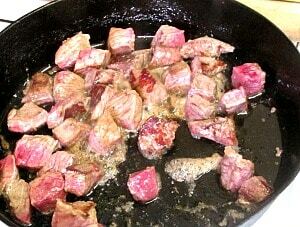 Add cubes of meat to the pan, making sure all of it touches the surface, and let it rest and sear two to three minutes. Then use a spatula to turn it over, so the browned side is up and you can sear the other side. You will notice that at least some juices are coming out of the meat, and if it has a lot of fat, some of it is melting – this is fine. Every minute or two, use the spatula to stir the meat, so that a new side browns. You may not get all sides of all pieces, and that is all right – this meat is not fully cooked, after all, and you will continue to cook it later. When it is mostly browned, remove it from the pan with a slotted spoon, and put it in a heatproof bowl to cool. Let the pan heat again a little, then continue with more cubes of meat. Repeat the process until you have cut and browned all the meat. Let it cool, and then bag it in sealed freezer bags. 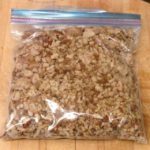 I do not press the air out at this stage, as I want the cubes to have enough room to freeze without sticking – once they are frozen I break them up a bit in the bag so that I can remove small amounts at a time. Last week, when I decided to make the chili, I went to the freezer, and took out the last bag from my most recent batch, and weighed it. I had twelve ounces of meat, decided that was the right amount, and put the bag down in the fridge to thaw. If it had held more, I would have shaken out the amount I wanted into a container, covered it, and put it in the fridge, returning the rest to the freezer. And now, you see – if I needed to set chili up in a rush in the morning? I’d cook the beans overnight (or just open a few cans… that is always an option.) I would either have already frozen chopped and sauteed onion, or I’d have browned extra onion the night before, when I cooked dinner, and put it aside. If I were using whole chilies, as I did, I’d have prepared them the night before – or just used my favorite chili powder out of a bottle. 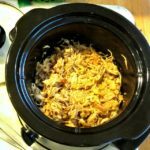 And this is how I can set up chili in the slow cooker in ten minutes in the morning, with comparatively little work the night before – weeks earlier, I spent half an hour or so to do this one step for many meals. Remember, the meat is not cooked through, and there may be some uncooked on the outside – I continue to handle it as raw meat for food safety reasons. (Make sure the family doesn’t sneak bits while it is cooling. Yeah, I caught him in time…) I want it to continue cooking in the stew, soup, or chili for better flavor… without being cooked to death. And so – one side note – in some circumstances, you may want to follow browning with a simmer, so that the meat is fully cooked, and can simply be added to a sauce or leftovers just long enough to heat. 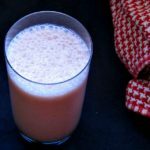 You lose a little flavor that way, but it can be worth it if you want to set something up for someone who may have trouble cooking. I did that with pork chops last year, for Rich’s parents, so they could just heat them without worrying about cooking them through. I can see doing that and then just putting them with some sauce in carried meals to microwave. It’s not something you’d typically do – but it can solve some problems, and is worth remembering. Either way, it’s a very helpful technique for fast easy meals at a later date. Usually I just do it all on a day when I do have some time, and then continue making stew with the final batch – including all the drippings, for added goodness! That way, it really doesn’t take much longer than I’d spend anyway on the pound or so I need for that recipe – and I’ve saved the step for at least two or three other days. 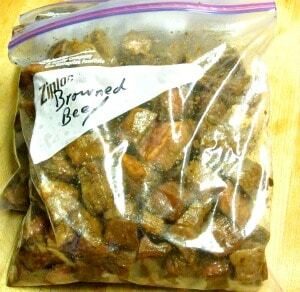 Brown several pounds of beef cubes and then freeze them. They are ready to drop right into a slow cooker without fuss, but with the delicious flavor. Set a heavy fry pan over heat so that it heats evenly and thoroughly. Cut the meat into bite sized pieces - the size you want to use in stew, soup, chili, or whatever. When the pan is heated well, add oil. 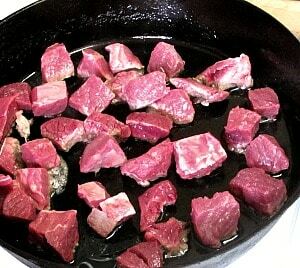 When the oil shimmers, add beef cubes in a single layer, so that they each sit on the hot pan to sear. Do not crowd the pan. After 2-3 minutes, when the meat has browned, use a spatula to turn them. Repeat every couple of minutes, still on high heat, until most surfaces have been browned. Remember, you do not want to fully cook the meat - just brown the surface. 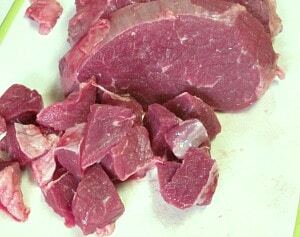 Remove beef to a heat proof dish to cool, repeat the process, in several more batches, until done. 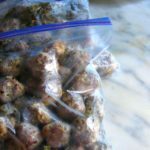 Once meat has cooled, package it for the freezer, and freeze. 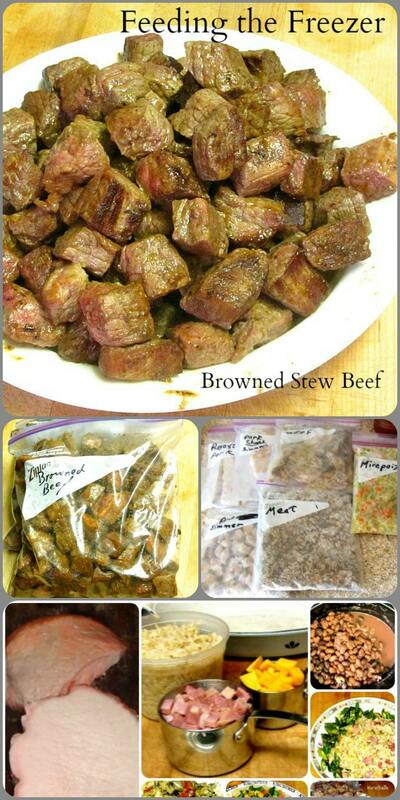 Use later in recipes that call for browning stew meat. Pre-browned meat is particularly helpful for slow cooker recipes, since you can set it up in the morning without having to stop, cut and brown the meat, and wash a pan. Do remember that the meat is not fully cooked - this is intended to simmer in your final recipe, improving the flavor of both meat and sauce. 3 pounds of meat is my suggested minimum - since recipes typically call for a pound or more. It can be well worth it to do this with a whole 7 pound roast, especially if your family (and freezer) is larger than mine. Thank you! Oh, I always cook extra (well, easy enough with just two of us) and in fact I'd already done that with the chili I wrote about in the previous post. But I don't always have freezer space for a few quarts of chili. 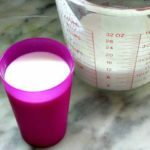 It can make more sense to keep the dry beans and canned tomatoes on the shelf, and just deal with the meat... which is both the perishable and the component that takes an extra step. Meal planning is so beneficial. I wish I had the room in my freezer to actually do this on the regular, haha! Great tips, though! 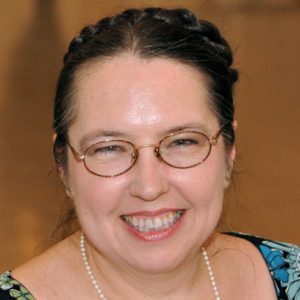 This is definitely useful information and inspiring when so close to the "spring cleaning and planning to do better" time of year. I know - this takes less room than fully prepared or prepped meals, but it still takes some! Still an idea to have in mind if you ever do grab a package on sale, though, and would be freezing it anyway... But thank you! Love all these tips! It makes cooking things on a weeknight so much faster!!! This is SUCH a good idea to make meat ahead of time for different uses. I can't wait to try your freezer tips! Thank you! I hope they are helpful! What a great idea. Really. This is the most brilliant things I have ever heard. I always struggle with thawing in time to get meat to properly brown. Great idea and I love step by step photos! Great idea - I was just talking with my girlfriend the other day about what would be helpful for a new Mom, and we were saying freezer meals! This would be a great addition! I'm all about meal prepping and this is such a great idea for stews and soups. Being able to pull this out of the freezer, pop it in the slow cooker with some other ingredients and walk away is my kind of meal! What a great make-ahead idea! I bet you can save a lot of money doing this..definitely going to give this a try.